You know what I’ve realized … when it comes down to it, many of us are in the same boat. We all want to live the life we’ve imagined for ourselves and feel really good as we live it. Would you say that’s true for you too? I know it is for me and when I realized almost six years ago that something was “off”, I also knew I had to find the solution. I wasn’t sure what specifically was “wrong”, but I knew my life was not supposed to be about working a lot but never feeling like I was getting enough done, worrying about one thing or another, stressing about the future, and questioning if I was doing everything I was meant to be doing. I just knew that couldn’t be the way things were supposed to play out. You’re not meant to go through life feeling as if there is “Something More”. So, I went on a search to figure out what was “off” and what I realized was that I wasn’t listening to that voice deep inside. I was ignoring the inner voice that urges us to believe in ourselves and what we’re really capable of so we can go after those things we truly are meant to do. It’s an easy trap to fall into isn’t it? There are usually fears, doubts, and limiting beliefs always ready and willing to hold us back and keep us trapped exactly where we are. But, once you realize you’ve fallen into a trap, the only logical thing to do is find the way out — and so that’s what I committed to doing. That commitment to find my way to my “Something More” changed the entire course of my life and lead me to the discovery of the steps that always need to be taken to accomplish the things important to you. Because, let’s be real, it’s one thing to realize that there is something you want to accomplish, BUT its an entire different thing to know exactly what you need to do get there. When it comes to accomplishing anything what I figured out is that there is a specific path. 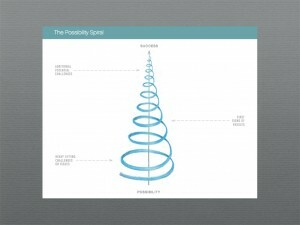 It’s called your Possibility Spiral and there are seven steps you’ve got to take to travel up any Possibility Spiral. As many of you already know, for the last year, I’ve been researching these 7 steps and putting together an online video course that shows exactly how to take each step and accomplish those things that are important to you. I am so excited the time has finally come and the course officially launches today. And, I am hoping you will join the course. The course is all online and you can watch it from the comfort of your home or office or just about anywhere else. All you need is the internet to access the special member-only website. If you do decide to join, you will get immediate access to all the videos and tools you need to accomplish exactly what you want. And, of course you will have complete access to me as you walk through the 7 steps because I am committed to helping every single person who is looking for their “Something More” find their way to it. I really believe with all my heart that 2013 is the year that we all are meant to make some BIG things happen. Don’t you feel that way too? It is time and if we put in the work this year, there’s no way we will not accomplish the things we want. I would love to show you the roadmap and walk you through the specific seven steps you need to take to accomplish whatever it is you want – even if you’re unsure as to exactly what that may be. If you’re interested, you can Click Here and find out more information about the course. 1. Commit today to getting to where you want to be. No more excuses. No more allowing the Chief Negativity Officer in Your Mind to hold you back. It’s time to go. 2. Take the First Step Today. Start rethinking what’s possible and take Step #1. Did you like this article? Please share your thoughts in the comment section below.